Killer Characters: Is That My Mom Coming Through the Door? Is That My Mom Coming Through the Door? Quick! Hide me. Where’s the back door? Oh, right, this lighthouse doesn’t have a back door. A closet. Looks like we’re short on human-sized closet space as well. Drat, too late, she’s seen me. Smile, Lucy, smile. Look happy. As if I need to ask. I know exactly why Mom is here in the Bodie Island Lighthouse Library and why she didn’t tell me she was coming. She didn’t tell me she was coming, because she was afraid I’d find a sudden reason to be heading out of town. As for why she’s here. That’s obvious also. She wants to take me back to Boston with her. You see, I left my long, long, long time boyfriend down on one blended knee (small blue box in hand) and fled town. I came down here, to my favourite place in all the world, the Outer Banks of North Carolina, to think over what I was going to do with my life. 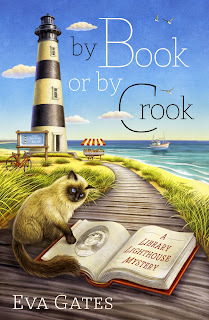 I didn’t have to think for long, as I found myself with a job in the Bodie Island Lighthouse Library. I love it here. I love the library, I love my coworkers, I love my Lighthouse Aerie on the fourth floor. I love the library cat, Charles. I love living and working in the Outer Banks. I am NOT going back to Boston. So there Mom! I’ll be firm, yet nice. I’ll welcome Mom’s visit and let her know I am not leaving. I’ll even go with her to the Ocean Side Hotel in Nags Head and help her check in. Surely she can’t get into any trouble there… can she? I love my mother. Truly, I do. She’s never shown me anything but love, although she’s tempered it by criticism perhaps once too often. She believes in me, I think, although she’s not exactly averse to pointing out that I’d be better off if I did things her way. She’s a kind, generous person. At least, that is, to those she doesn’t consider to be in competition with her for some vaguely defined goal, if not -- watch out, she'll carry a grudge to the grave. She may be stiff and formal and sometimes overly concerned with observance of proper behavior, but she’s also adventurous and well-travelled. And above all her love of her children knows no bounds. I do love my mother. I just wish she wasn’t bearing down on me at this moment, face beaming, arms outstretched. I think I could be the mother in this book. I am a perfectionist and no matter how much I try, I feel my daughter always feel that I am too judgemental. But loving, I am sure. Just like Lucy's mother. Love this series and look forward to reading this one. I love the kitty on the covers. Thanks for the contest. Loved the first book, and thought her mom was a piece of work. She and her husband need to let Lucy live her life as SHE chooses. I own the first book and would love to add this new one to my collection. I enjoy reading your books. This one sounds really good. The Outer Banks is on my bucket list. This sounds like a great series and love the covers. Thanks for the chance to win. If you go there, you won't be disappointed. I do love the idea of a library in a lighthouse and living quarters there as well. I love the idea of a library in a lighthouse! I would love to read this book. Sounds so interesting. Thanks for the chance to win! The covers are beautiful, aren't they? Would love to read this book! Looks like a fun read! Thanks for the chance! Moms can always strike terror in your heart, can't they? Or I should say we, because I'm sure I do it, too! Looks like another good entry in this series. Thanks for the giveaway. No matter how old we get, we want to please our moms! I can hardly wait to read the second in the series! A library in a lighthouse! What an absolutely splendid idea! Love lighthouses. Always have even living in Texas panhandle growing up. Now live on the coast. Loved reading the first book. Library in lighthouse might be my fantasy job! Often dreaded Mom's visits; but now miss them and her. What complicated relationships we have with our mothers. Libraries & lighthouses, how lovely! I have any Book or By Crook. I haven't gotten to read it yet. I'd love to add #2. Congrats on the latest book! Like Pamela Woodfield, Lighthouses and libraries my two favorite places. I am always amazed at how quickly new books come out as I am not talented in the writing department! Thanks, Patricia. I know I'll have a marvellous time. Love the covers of both of these books. The story sounds great!! I love the covers. They sound like a wonderful read. I just love the covers of these books. I have 5 miniature lighthouses someone brought me from a trip to the Outer Banks. Love my Library. Best of Luck with your new book. The first book was fantastic and I can't wait to read this one. Thanks for the chance to win. Love the covers of your books. Would love to win. Your covers are so darling. Another new author for me and looking forward to reading this book. I like the idea of a library and living quarters in a lighthouse. Love the series! Thanks for the opportunity to win! Ooooh. 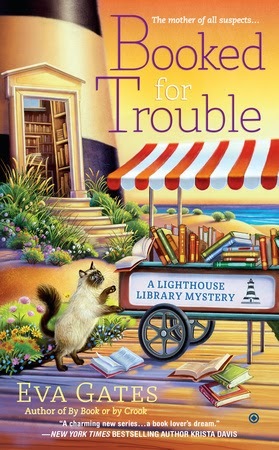 A lighthouse library, that would be so much fun to work there. I can't wait ti read this. Thanks for a chance to win. The winner has been chosne and notified. Thanks everyone for entering, and happy reading.